MonotomidGen was created to facilitate the identification New World species of Monotomidae, a small family (36 genera, 258 species) within the superfamily Cucujoidea (sensu Robertson et al. 2015). Monotomidae includes many species that are of economic or ecological significance, some of which are recognized as forest pests, pollinators, myrmecophiles, and melittophiles (Bousquet 2009). 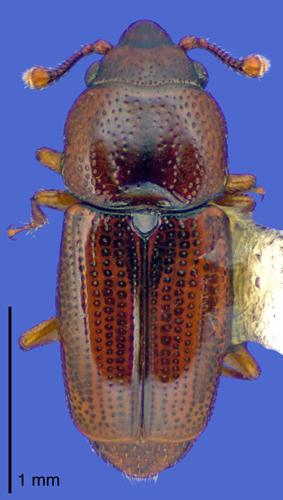 Most monotomids are thought to be predaceous or mycophagous. MontomidGen has several sections with different functions. The Genus Fact Sheets provide detailed information and dozens of photomicrographs about the genera and species occurring in the New World. The Interactive Key is a flexible, matrix driven, multientry key to the New World Genera of Monotomidae (with illustrated choices). Resources are provided to aid those who are inexperienced with identifing monotomids (e.g. What is a Monotomid?, Glossary of Terms, and Anatomical Atlas). The References section contains bibliographic information and links to PDFs for literature that is no longer under copyright protection. This study was supported by a UGA CURO Research Grant (OF Boyd & JV McHugh), an H.H. Ross Memorial Fund Grant (TC McElrath), an Ernst Mayr Travel Grant from the Museum of Comparative Zoology at Harvard University (TC McElrath), and a CanaColl Foundation Endowment Fund Collections Grant (Y Bousquet & TC McElrath). We thank Darren Pollock (Eastern N.M. Univ. ), Zach Falin (Univ. Kansas), Bob Turnbow (Enterprise, AL), the late Chuck Bellamy (CDFA), and Andy Cline (CDFA) for providing critical specimens for this study. We would like to thank Floyd Shockley and David Furth (NMNH) for their assistance and hospitality. We thank Gene Wright (UGA Lamar Dodd School of Art) and Zach McElrath for technical assistance, and the UGA Department of Entomology for supporting this project. Yves Bousquet, Nathan Lord, and Michael Thomas reviewed the manuscript and webpage and provided valuable comments and revisions. In addition, Lynette Elliott (Bugguide.net), Jeff Gruber (Flickr), Insect Images (Bugwood.org), Nathan Lord (coleopterasystematics.com), Chris Mallory (Bugguide.net, http://socalfauna.net), the Pest and Disease Images library (PaDIL), Udo Schmidt (Flickr, Coleoptera of the World), and Michael Thomas (Bugguide.net, FSCA) generously allowed their photos to be used for the Monotomidae diagnosis page. The MonotomidGen website (v1.0) (released November 2016) (and all images, media, and text within) is licensed under a Creative Commons Attribution-NonCommercial 4.0 International License . It is published with ZooKeys and available here: https://doi.org/10.3897/zookeys.634.9857. The key herein, however, is licensed under a Creative Commons Zero license , and the data matrix and all resources within the key itself are available from DataDryad here: http://dx.doi.org/10.5061/dryad.q9p4j. Questions? Comments? Complaints? Need to be sure you have a correct Monotomid identification?